A friend of ours in the Bahamas had a close brush with a large reef shark recently. As you can see from the photos, the shark was not too pleased with his vessel. 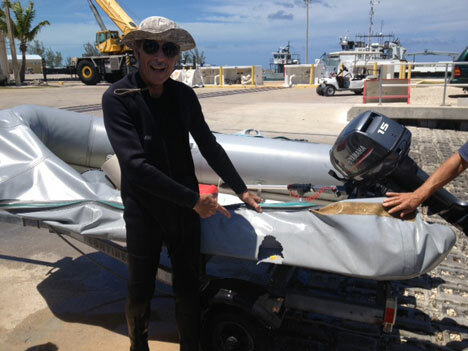 He came upon some divers who were being monitored pretty closely by a shark, so he decided to try and drive it away. He circled around the area, expecting that the noise of his engine would encourage the shark to move out of the area. 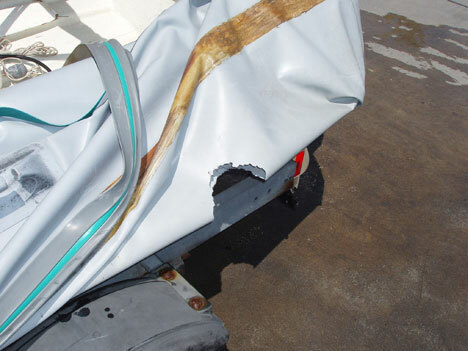 Everyone thought the shark had moved on when it reappeared and took a sizeable bite out of the flotation tube! The shark certainly made its feelings about the boat known, but boater and divers all made it back to shore unharmed. Mel King, President of Big Blue Wreck Salvage, is a maritime historian and one of the country's leading experts in Spanish Colonial numismatics. Artifact Exchange International™ is sponsored by Big Blue Wreck Salvage, Inc. (BBWS). For over 25 years, BBWS, Inc. has specialized in authentic Spanish Colonial coins and shipwreck recovered artifacts. Our vault is full of one-of-a-kind items such as shipwreck recovered Spanish “pieces of eight”, gold doubloons, nautical antiques, and ancient Greek and Roman coins. We strive to curate a collection that appeals to “first-time” buyers as well as serious collectors searching for rare pieces of history. The more unique the better! We stand behind everything we sell with a lifetime guarantee of authenticity. Our knowledgeable staff is here to assist you with your questions. Copyright © 2016 BBWS, Inc. All rights reserved.